A cookie is a small amount of data, often including an unique identifier, sent from a website and stored on your device. 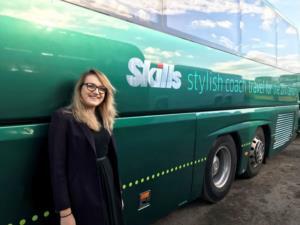 Skills Motor Coaches have recently appointed a new member of staff within their private hire portfolio to grow a new division of corporate hire services. Evie Wisniewska, 22, is joining the team within Business Development and with her passion and enthusiasm for the industry; is excited to meet local businesses to discuss their bespoke travel solutions. Evie has been an integral member of the Skills staff, managing the Laver Holidays brand and has an in-depth knowledge of Skills core brand values. Originally from Poland, Evie has been in UK for the past 12 years and aligns these experiences to combine both international and local knowledge to create the ideal travel solution for local businesses. Evie feels that this role will allow her to showcase her innovative skills and bring her ideas to the table, but more importantly implement them. Previous experience in the product department has given her a range of good quality contacts with stakeholders in destinations around UK and Europe which will become beneficial for any business that she works with. Guild membership a commitment to quality. Awards our members have won. Find a dependable UK coach operator. What types of transport services do we offer? Find out more about the quality checklist. © The Guild of British Coach Operators Ltd. All rights reserved. company number 5180585, as a company limited by guarantee. Registered office: 3 Acorn Business Centre, Northarbour Road, Cosham, Hants, PO6 3TH.